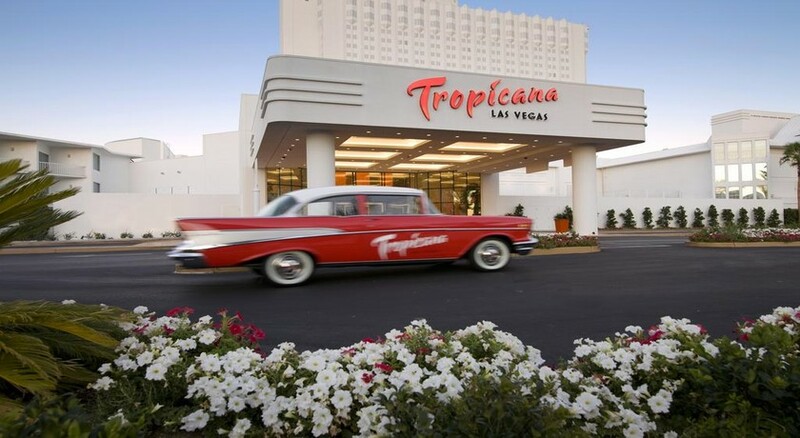 An expansive resort with a cosy boutique vibe, the Tropicana Hotel is the perfect choice for those seeking a memorable Las Vegas holiday stay. Situated to the southern side of Las Vegas Boulevard, the 22-storey Tropicana Hotel comprises a total of 1,658 rooms, of which 166 are luxurious suites. 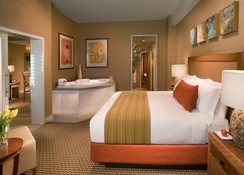 With superb amenities and facilities, including the Glow Spa & Salon and fitness centre, the Tropicana Hotel also offers award-winning restaurants serving delicious cuisine, one of Las Vegas’ most popular casinos and a host of entertainment options, including David Goldrake’s Imaginarium magic show. Tropicana Las Vegas is situated in the southern side of The Strip, also known as Las Vegas Boulevard. 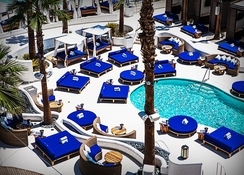 The resort is located at a distance of 2.2 miles from McCarran International Airport. 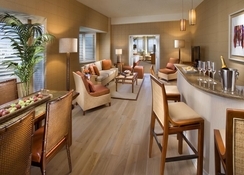 The rooms and suites of the Tropicana Hotel are comfortable and stylishly-appointed. Accommodation is available in 3 configurations: Deluxe Rooms, Suites and Villas. Deluxe Rooms can be selected with Club access and can be specified as Deluxe Plus Rooms, Paradise Deluxe Rooms, Deluxe City View Rooms and Bungalow Deluxe Rooms. For greater versatility, Paradise Suites, Club Suits, Club Spa Suites and the Penthouse Loft are available, while the luxurious Villas are available with one bedroom or two bedrooms, as well as a private pool. The Tropicana Hotel boasts a superb array of excellent restaurants, including Robert Irvine’s Public House, where you can feast on hearty English-pub styled food, devour Italian fare at Bacio and enjoy succulent steaks at Oakville. Head to Beach Café for a coffee kick by the poolside or grab some grub on the move with the South Beach Food Court. 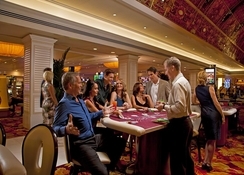 Try your luck at the famous Tropicana Hotel Casino, one of the 10 most popular casinos in all of Las Vegas, where table games, slots and bookies are available for your entertainment. David Goldrake’s award-winning Imaginarium magic show leads a star-studded entertainment package at Tropicana Las Vegas, including comedy shows by Andrew Dice Clay and the Laugh Factory. The Tropicana Hotel pool is paradise for sun lovers, while Glow Spa and Salon provides pampering treatments for your body and soul.